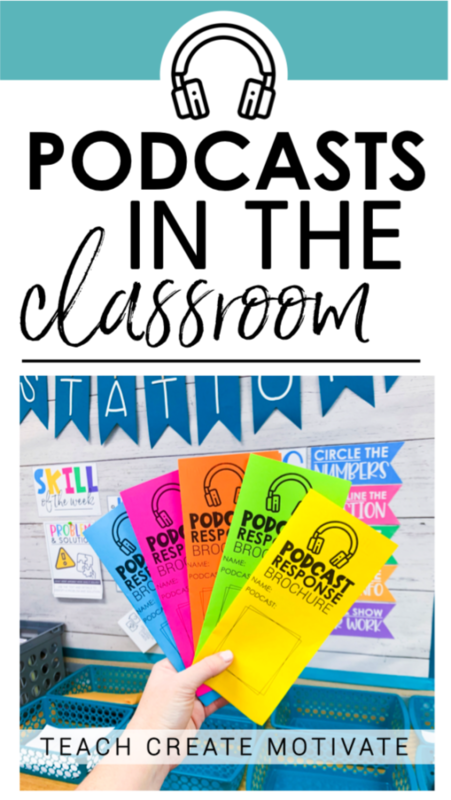 Podcasts in the classroom are so fun and engaging! Have you jumped on the podcast train yet?! 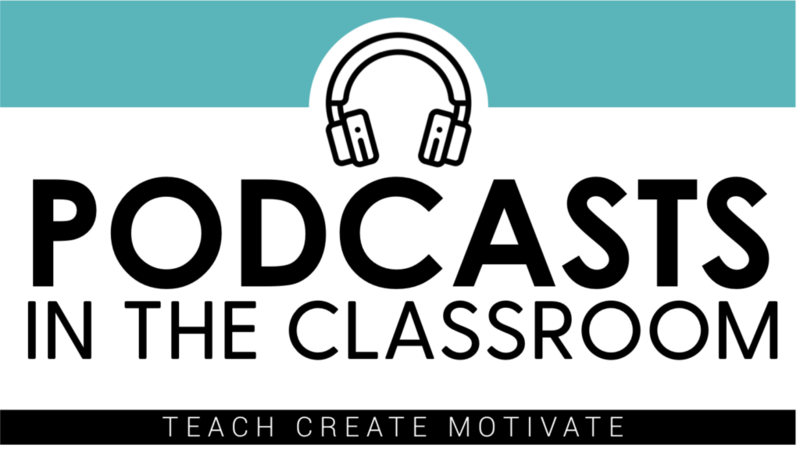 Whether you’re listening to your own podcasts on the way to work or you are finding ways to get your students listening-they’re blowing up! 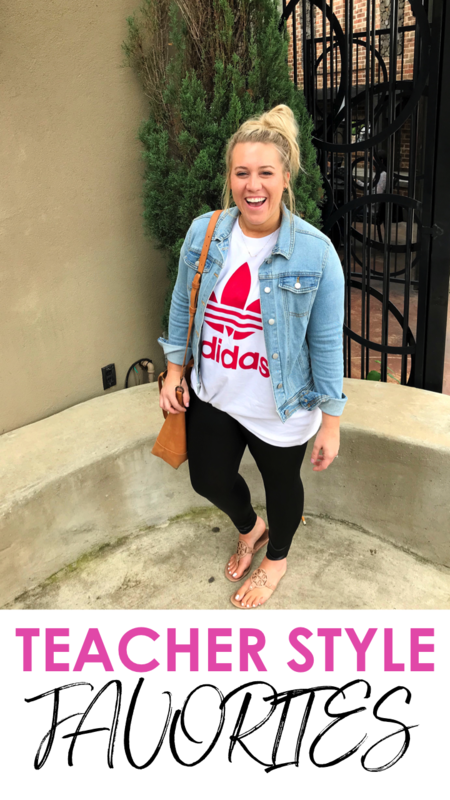 I had seen many teachers talk about using podcasts in the classroom a few times on instagram and read a few articles about it online, but wasn’t quite sure how I personally wanted to incorporate them into our day in the classroom. I think I have found a great system that works for us so I wanted to share! 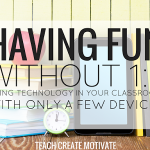 Student Engagement– this is HUGE! 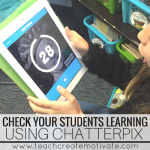 When students love what they’re doing in your classroom they are instantly engaged. Plus the topics they get to choose from to listen to are so interesting! 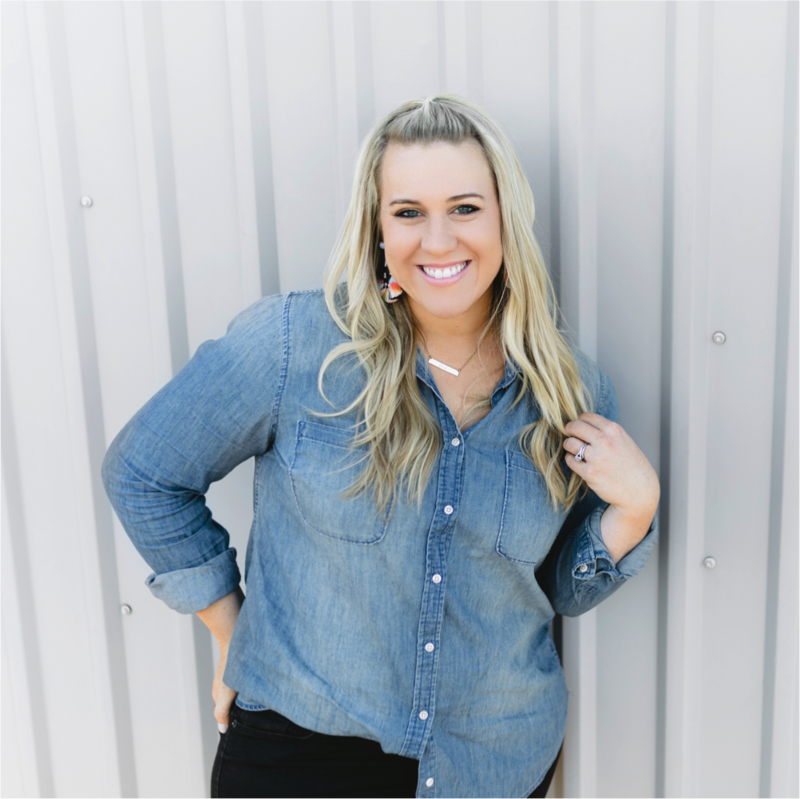 Listening Skills– this might be my favorite benefit yet. Listening skills are SO important, and it can be hard to find ways to foster those with our students. Podcasts are a perfect solution to this! Student Independence-You knew I was going to incorporate that somehow right?! I mean.. letting them choose what to listen to is such GOLD! 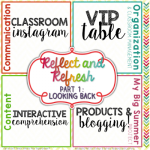 Reflective Thinking– Not only are they listening out of interest and engagement, but then we take it a step further and reflect on what we listened to. This involves thinking, writing, and even using our reading skills like summarizing, comparing and contrasting, and more! Whole Class Listening-find a podcast your students will enjoy and everyday (maybe during snack time, after packing up, etc) play 1 (or 2!) episodes while everyone is listening at the same time. This was PERFECT because when we started this, not ONE student of mine even knew what a podcast was! Now, they beg me to turn on an episode..and are super quick to remind me when I forget! Starting this way really created the buy in from them. It also led to great class discussions and still allowed my students the chance to reflect on what they were listening to. Independent Choice Listening- This is another way we use podcasts in the classroom now. 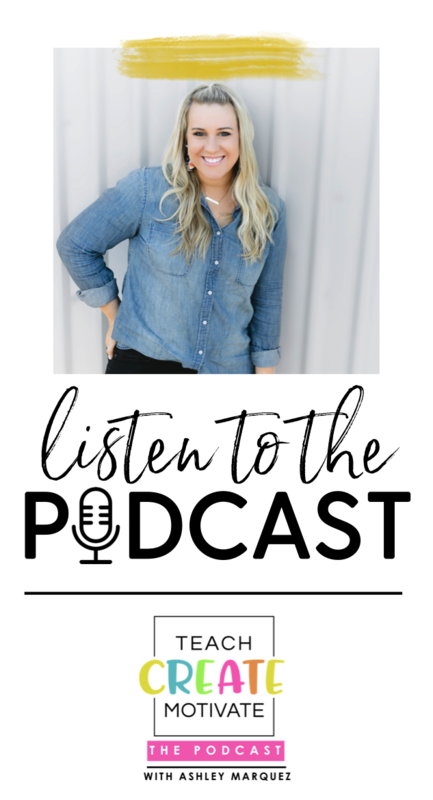 Once I introduced what podcasts were and they were excited from our whole class listens (1-2 weeks later), I explained that they would now be able to listen 1-2 times a week on their own. They were SO excited! The way we do this is during our stations time. I have talked about stations a few times, but in a nutshell we do Reading/LA stations everyday. My students have a menu of stations I set for them for the week-starting on Monday and finishing on Friday. I always make some stations “must dos” and some that they can do if they choose. My third graders get to choose what station they work on when. As long as they are finished by Friday, I give them that freedom. So adding podcasts into our weekly stations was VERY easy. I just simply made it a station choice on their menu for the week after explaining where to go to listen! We also talked about how to choose which podcasts to listen to and how to make sure they were appropriate for us. 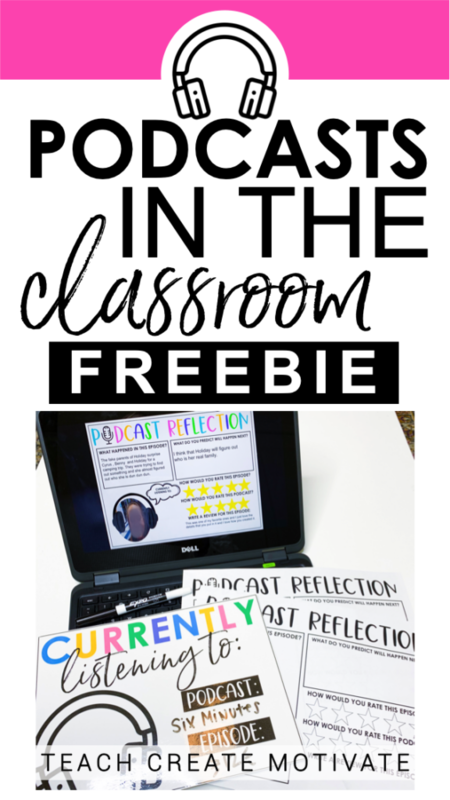 This is also a PERFECT way to use podcasts in your classroom even if every student doesn’t have a device! Making it a station that gets done once in the week means you can rotate your students through the 1 or more devices you do have! That could be a Chromebook, or an iPad, or tablet! The best website I can recommend for whole class and independent listening is Kids Listen. It is SO user friendly and really breaks down podcasts by age level. It is easy enough to navigate, and I love how it hosts them all in one spot! If you click “Find Podcasts” it will catoragize them into the age levels. You can also listen online through Sticher, iTunes, or Google play. You will just have to search that podcast specifically! Here is a list of our favorite podcasts so far! I created some reflection slides for my students to use when we listen as a whole class. I have them respond digitally, but there are printable pages as well. Once I decided to incorporate them into their stations I wanted a deeper way for them to reflect on episodes or multiple episodes of entire podcasts. I created response brochures for this purpose. 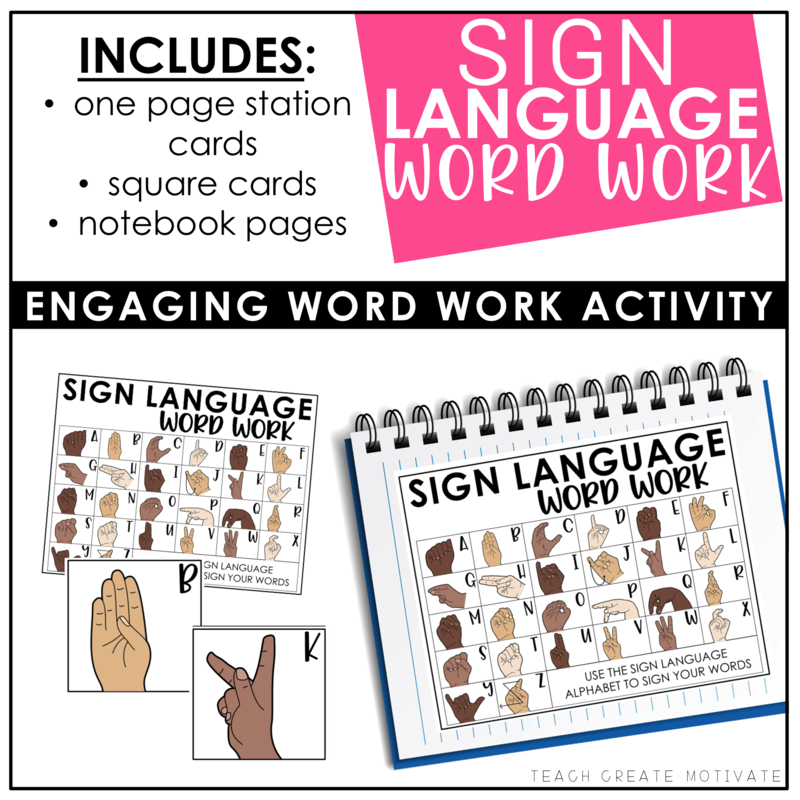 They are really useful, because they cover different reading and writing skills and can be used repeatedly. 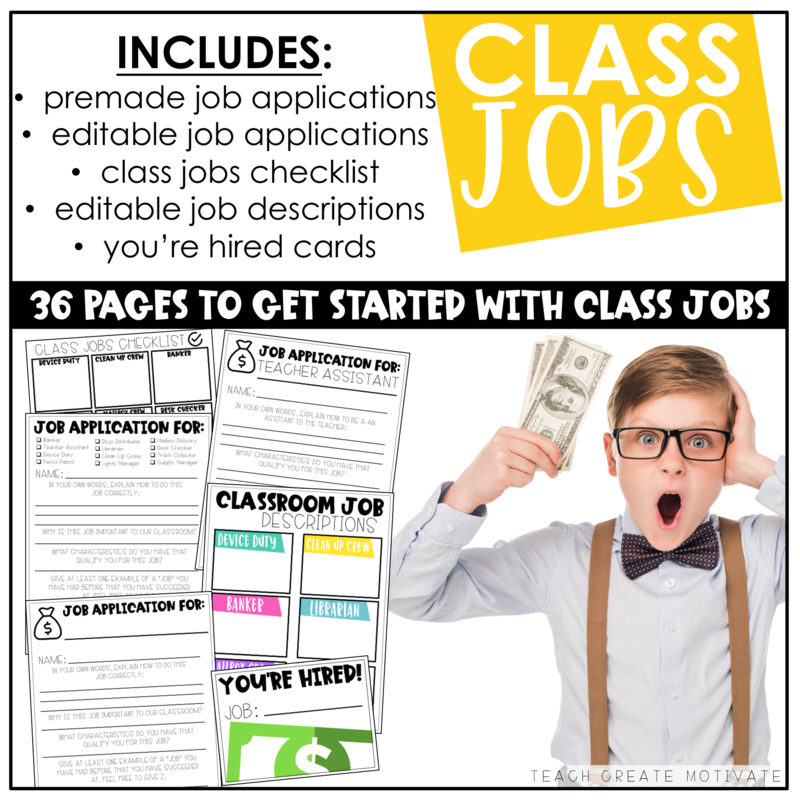 There are 24 different brochures that you just print and immediately use! 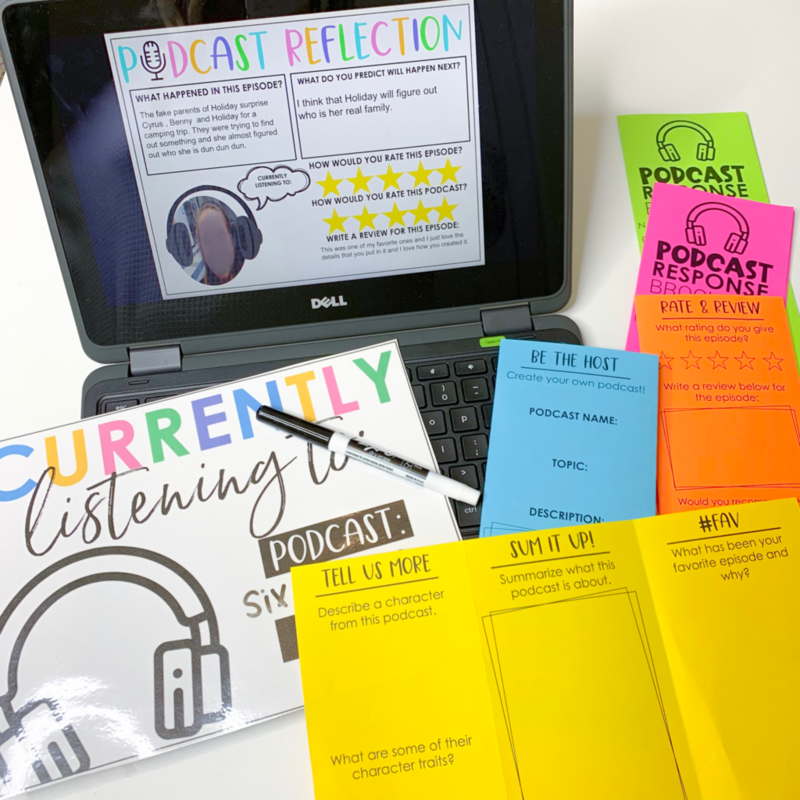 If you want to try podcasts and reflecting on listening with your students I made the reflection slides/pages available to you for free below! Use them digitally (some even have a selfie option!) or print them out! 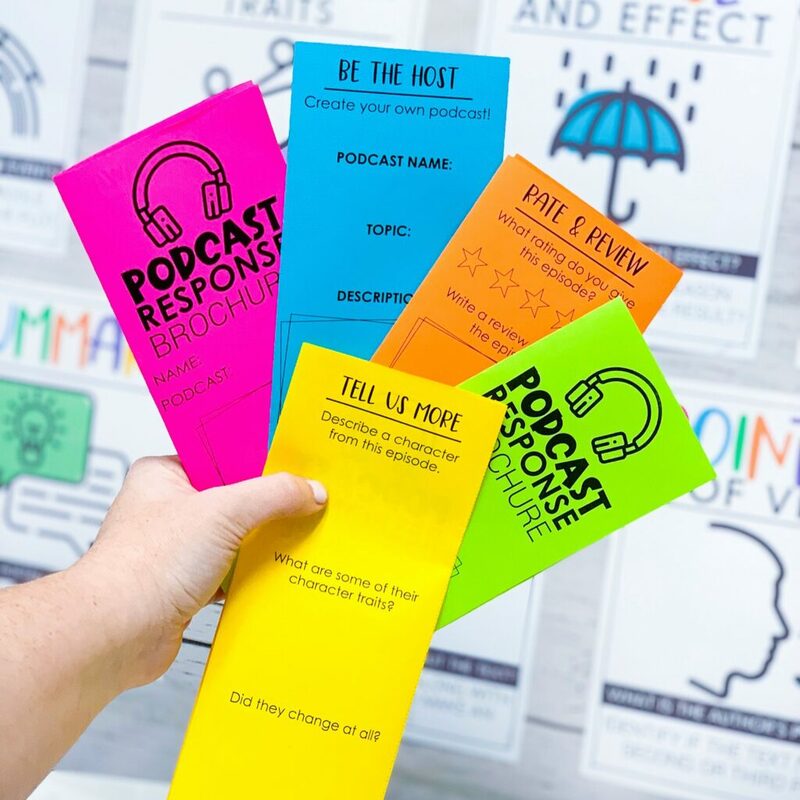 You can grab the Podcast Response Brochures to use all year with your students HERE! 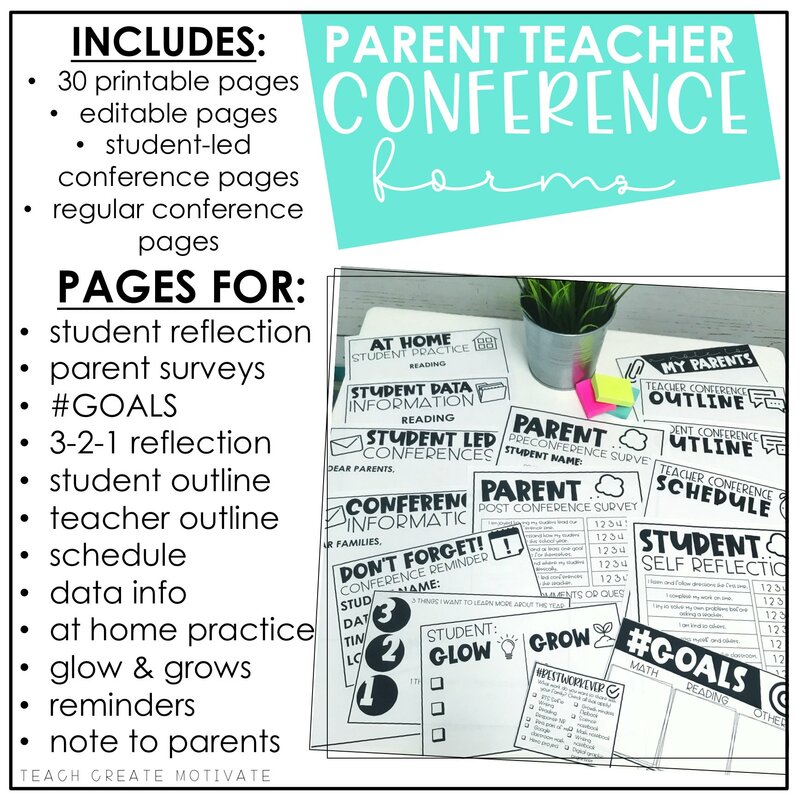 These print and go brochures make it so easy to add some reflective thinking, reading skills, and writing to your students listening! They make the perfect companion to your students listening station and even work for a quick grade! 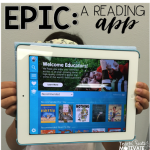 These print and go brochures make it so easy to add some reflective thinking, reading skills, and writing to your students listening!My students love them.